123 Reg Hosting Review: Can This UK Host Compete With Global Giants? 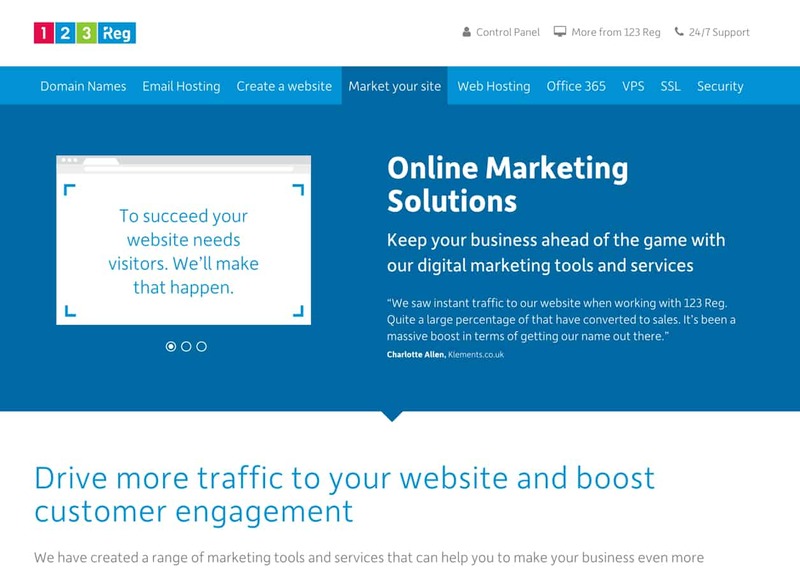 Need an easy-to-use website builder, marketing help, and low-cost hosting provider? Read our review of the UK-based 123 Reg company to get important facts. If you’ve ever tried to get hosting for your small business, you know that some hosting companies treat customers like numbers. You find the support isn’t anything to write home about, the servers are packed with websites, and the pricing eventually goes up year after year. 123 Reg, on the other hand, stands out by offering quality local support, solid hosting, and low prices. The catch is that the London-based company primarily sells to UK-based customers. You get to speak with British customer support reps, and the domain names are given out for free as long as you stick to a .UK domain. How Did 123 Reg Come to Be? Is 123 Reg Hosting the Right Choice? 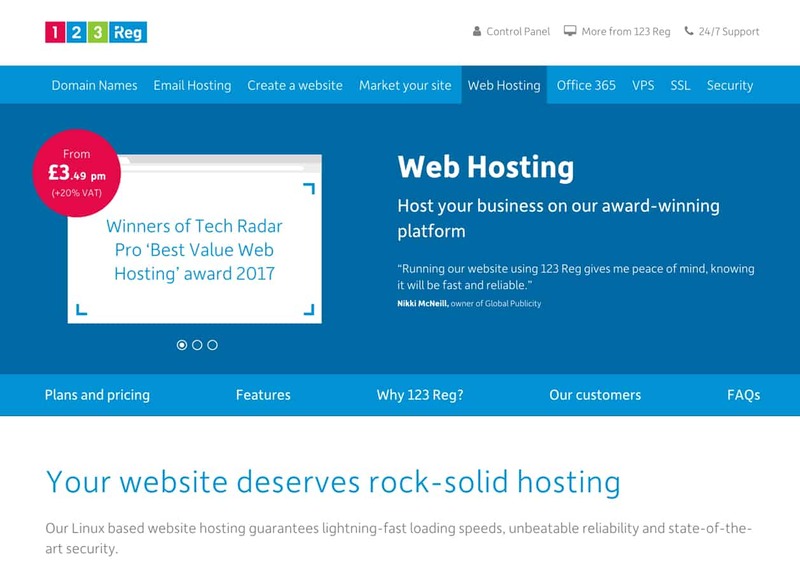 The backend of the 123 Reg hosting area is fairly easy to understand, but some beginners might be a little confused if they’ve never used web hosting before. That said, you can find everything from one-click installation buttons to MySQL database access. You have the tools for quickly launching your site, along with more advanced options for developers. 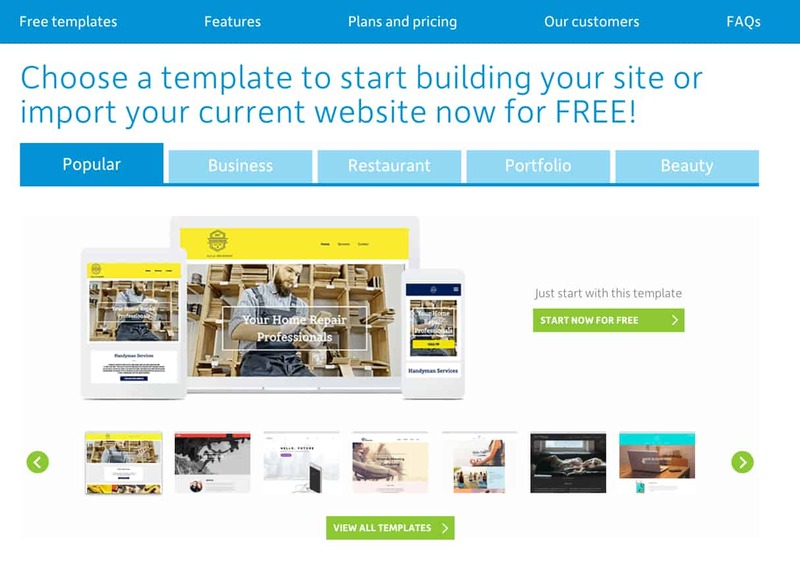 123 Reg also has a website builder with hundreds of templates. You can launch your store easily, and it has a full drag-and-drop interface so there’s no need to know how to code. 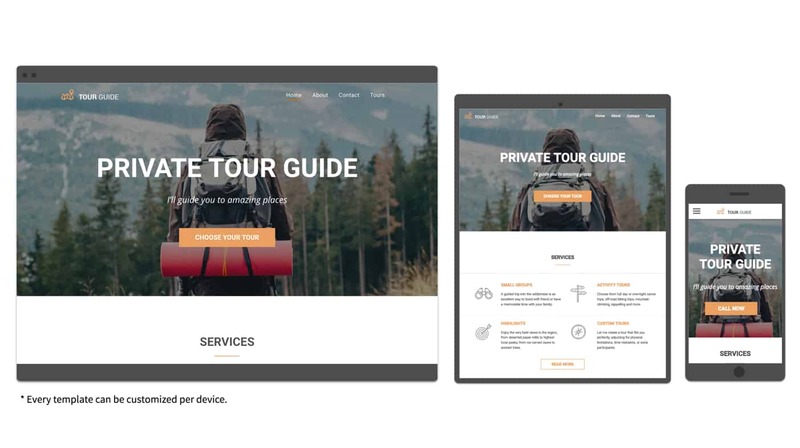 This is a basic website builder for small business sites, so if all you need are some social media buttons, pages, media support, and some other basic features, the builder should work just fine for you. One of 123 Reg’s many responsive website templates. Other cool features include image editing, complete e-commerce site support (along with support for numerous payment gateways), and blogging capability. Essentially, standard businesses should be able to make beautiful websites while also improving their SEO in the process. Automated site backups and a developer mode are included in some plans as well. With 123 Reg you can easily build a website and get marketing help as well. Finally, the website checker tool evaluates how good your website is. For example, if you’d like to learn about whether or not your design is attractive, the website checker gives you some hints. You can also get some pointers for improving your SEO. 123 Reg has always been focused on helping small businesses, and it all started in 2000. As you may have noticed above, 123 Reg is located in London, and primarily supports small- to medium-sized businesses in the UK. The company claims to have sold over 3.5 million domain names, while also hosting more than 1 million sites. This makes it one of the largest domain registrar companies in the UK, and it certainly doesn’t hurt that the company is owned by HEG, another large hosting company. Jonathan Brealey and Tim Beresford started the company back in 2000, just after they launched another company called Webfusion Internet Solutions. Over the years, 123 Reg has reached several milestones. For example, it became the first hosting company in the UK to offer Microsoft 2008 hosting. It is worth mentioning that a data breach occurred in 2016. 123 Reg also accidentally deleted hundreds of VPS sites that same year. The company apologized for the problems and tried to fix them as best it could. But unfortunately, many of the site owners lost all of their data completely. Many people have trouble choosing hosting. That’s one reason this industry has awards, so regular customers can take a look at the results. This way, the experts get to evaluate hosting companies and deliver educated results for customers. We would argue that its status as the largest domain registrar in the UK, is a solid reason to examine its plans. 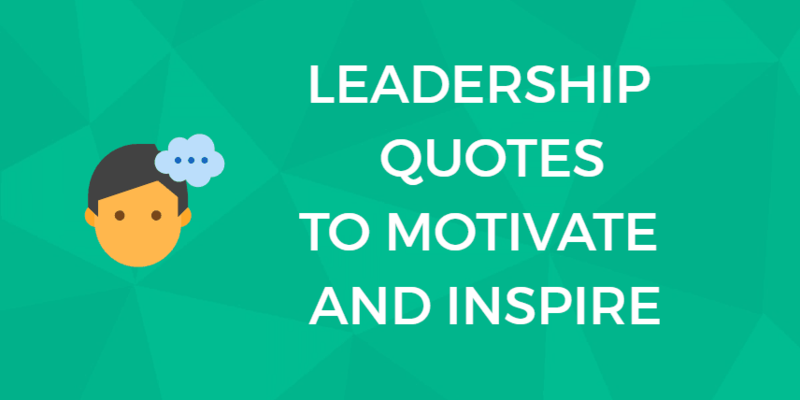 Besides being a good title to possess, it comes with benefits for users. First of all, every hosting plan from 123 Reg comes with at least one free domain name. In addition, the domain name pricing seems to beat out competitors, with extremely low costs and yearly plans. Another reason 123 Reg stands out is because of the wide range of services and tools offered. You rarely see hosting companies selling Office 365, and the VPS and SSL offerings are impressive as well. Some of the hosting packages even give you a free SSL for setting up a completely secure e-commerce website. 123 Reg’s technical support team aims to respond to your contact within one hour, regardless of the contact channel you chose to use, if you get in touch between 9 AM and 7 PM on the weekdays and 9 AM and 4:30 PM on the weekends. If you get in touch outside of those hours, expect a bit of a delay in response from the team. 123 Reg offers 24/7 support (with caveats, as explained above), and the representatives are located in the UK. This might not sound like a huge deal at first, but it’s certainly better than talking to someone in a call center halfway around the world. With UK-based support reps, the company can control what is being said and train those in-house people so that they know everything needed to adequately help customers. The support FAQ area has videos, tutorials, and other articles for guiding you through the hosting process. This is far more than a standard FAQ. As for the means of support, 123 Reg has live chat on its website, a phone number listed, and an email address you can contact. You can decide to sift through the various tickets submitted in the past, or you can send in your own ticket. Overall, 123 Reg has well-rounded support options. 123 Reg offers a 14-day cooling off period for non-business customers purchasing non-bespoke products (e.g., a web hosting package). If you cancel your purchase(s) during this period, you can receive a full refund of all fees paid. If you are looking into 123 Reg, you have probably come across GoDaddy as an alternative hosting company you should consider. How do these two companies compare? As you probably saw, 123 Reg is unapologetically British. If that works for you, great; however, if you want more generic branding (especially when it comes to your domain name), GoDaddy might be a better option cost-wise. Additionally, GoDaddy offers more hosting plan options from which you can choose. If 123 Reg’s offerings do not meet your needs, GoDaddy will likely have something that works for you. However, both company’s plans are easy to use, and both offer control panels to make working with your back-end easier (123 Reg appears to provide a custom control panel, while GoDaddy ships the cPanel with its packages). With that said, 123 Reg is a smaller company, so you may end up with a better experience when it comes to working with staff members. That’s the big question, isn’t it? Now that we’ve outlined everything about 123 Reg, it’s time to decide whether or not it’s right for you. If you want to avoid yearly plans, need a dedicated server, or have an enterprise-level business, 123 Reg won’t be a good fit. However, this host is an obvious choice if you live in the UK, or if you want an inexpensive hosting plan that comes with a free domain name. 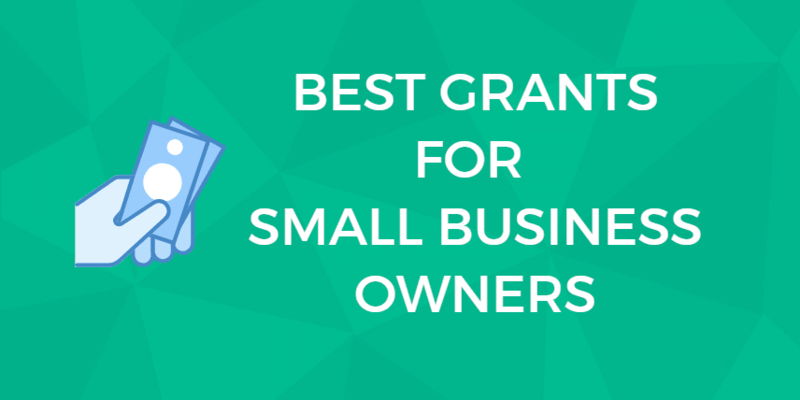 It’s ideal for small to mid-sized businesses and offers plenty of customer support options, too. 123 Reg is a solid hosting option, all around. But only by evaluating your company’s needs and budget will you be able to decide if this is the right hosting company for you. Check out dozens of actual user reviews at our sister site, WhoIsHostingThis.com. That way you can see what people who have actually used 123-reg hosting think. It should make your decision much easier. You are here: Home > Web Hosting: Which Hosting Company Is Best For You & Your Website? 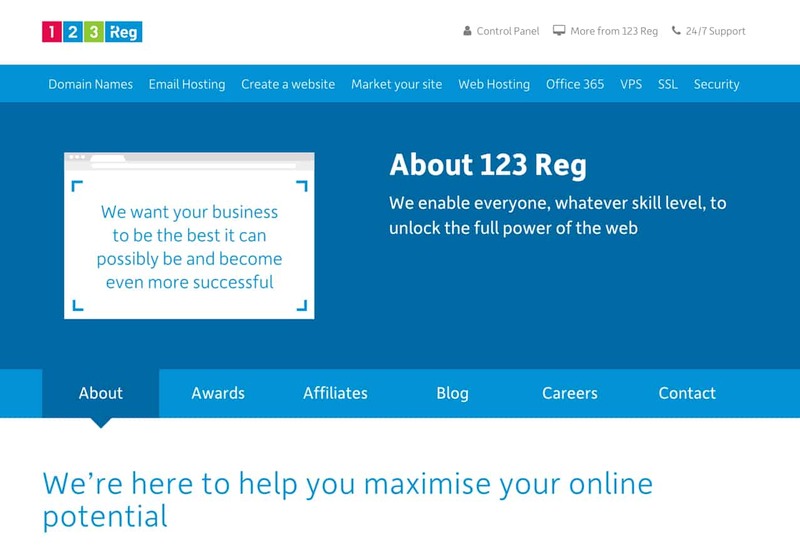 > 123 Reg Hosting Review: Can This UK Host Compete With Global Giants? Next: Easily Review: Best UK Budget Hosting for Small Business?